As predicted a month ago, the Bundesbank balance sheet grew materially due to increases in TARGET2 claims against other central banks. Again, these imbalances are driven by LTRO financing provided to periphery banks. In an LTRO transaction the periphery National Central Banks (NCBs) credit the accounts of their nation's banks (who seek LTRO financing) and debit the Eurosystem account. The periphery banks then pay down secured loans from German banks (replacing them with LTRO), increasing Bundesbank's TARGET2 claims (as euros move from periphery to Germany). In effect Bundesbank partially finances the periphery NCBs via the ECB. Below is the latest snapshot of Bundesbank's balance sheet. Explanations: * The balance sheet items for gold, foreign currency, securities, and financial instruments are revalued at market rates at the end of each quarter. The figures for the latest date are always to be regarded as provisional. Subsequent revisions, which appear in the following publication, are therefore not specially marked. Discrepancies in the totals are due to rounding. — 1 For the detailed composition of the Bundesbank’s currency reserves, see table "Official reserve assets and other foreign currency assets" (Statistics/Regularly up-dated economic data/Data Template on International Reserve/Foreign Currency Liquidity), which is updated on a weekly basis. — 2 Deutsche Bundesbank’s claims on and liabilities to non-Eurosystem central banks are not included, see also footnote 4. — 3 Excluding Deutsche Bundesbank’s claims on and liabilities to central banks of the Eurosystem, see also footnote 4. 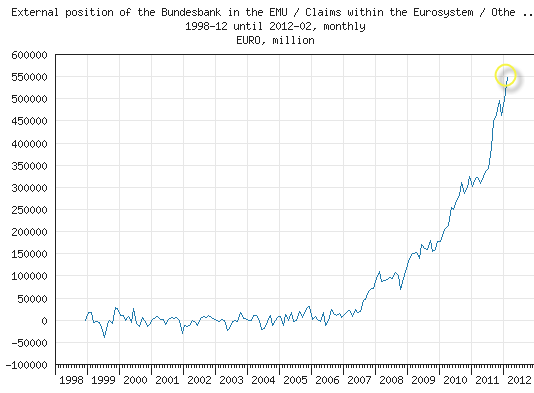 — 4 Deutsche Bundesbank’s claims on and liabilities to central banks of the European Union (i.e. central banks of the Eurosystem and non-Eurosystem central banks) are recorded on a net basis; the net position of the Deutsche Bundesbank vis-à-vis central banks of the European Union is included within the item "Other assets" ("Other liabilities") if it has a positive (negative) sign. — 5 According to the accounting regime chosen by the Eurosystem on the issue of euro banknotes, a share of 8% of the total value of the euro banknotes in circulation is allocated to the ECB on a monthly basis. The counterpart of this adjustment is disclosed as an "Intra-Eurosystem liability related to banknote issue". The remaining 92% of the value of the euro banknotes in circulation are allocated to the NCBs on a monthly basis too, whereby each NCB shows in its balance sheet a share of the euro banknotes issued corresponding to its paid-up share in the ECB’s capital. 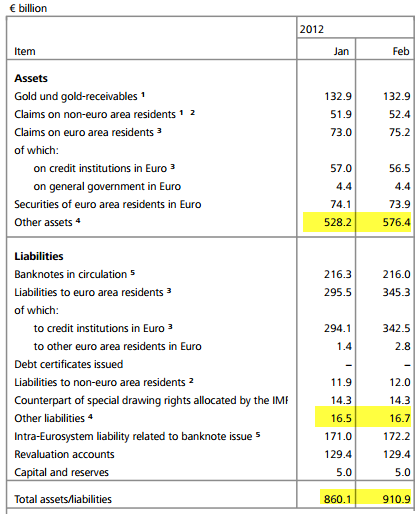 The difference between the value of the euro banknotes allocated to the NCB according to the aforementioned accounting regime, and the value of euro banknotes put into circulation, is also disclosed as an "Intra-Eurosystem claim/ liability related to banknote issue". Note that in order to obtain the exact TARGET2 position of the Bundesbank, one needs to net the "other assets" with "other liabilities". There is also a relatively small amount of claims against EU central banks that are not part of the Eurosystem that should be taken out. For the purposes of tracking the general trend however, that component can be ignored. This would not be an issue if the Eurosystem is to stay intact. However should a nation exit the euro, its central bank may not have the ability to cover its TARGET2 liabilities. In that case the ECB and the member states would be responsible for parsing out the losses among the remaining states based on their share. Bloomberg (ht Kostas Kalevras): The Bundesbank won’t lend to banks against bank debt guaranteed by Greece, Ireland and Portugal from May, the newspaper said, citing unidentified officials. The Frankfurt- based central bank currently has less than 500 million euros ($667 million) of those bonds on its balance sheet, FAZ reported. These specific bonds constitute a relatively minor exposure for the central bank, but because of the massive claims against the NCBs, it is trying to cap the overall exposure. This highlights Bundesbank's concern about the stability of the Eurosystem in its current form. It is possible this concern will soon spread to other core central banks, creating further rifts within the Eurosystem.